Cloud-based medical billing software is the benchmark in contemporary healthcare industry. It provides the exclusive advantage of being accessible from anywhere, using any digital device. With data managed on the web securely encrypted and efficiently backed up, all that is required is Internet connection and a web-enabled browser for using this novel Medical Billing Software. Designed to cater to the needs of small, medium, and large scale healthcare facilities, web-based or cloud-based medical billing software allows use by multi-location facilities. The efficient system helps set up custom and real-time reporting that can be accessed on the go. Integration with the Internet is the order of the day. Among the wide range of automated systems that assist the medical industry, the cloud-based medical billing software helps practices to achieve accurate and seamless medical billing process. 1) Real-time data access: Cloud-hosted system ensures that critical medical data is in sync across any digital device in real-time. This helps improve clinical decision making that is crucial for patient outcomes. 2) Reduced cost: Applications being hosted remotely, there is no need for hardware or software investment here – this model follows the ‘pay-for-use’ mode. 3) Increased collaboration and better mobility:Cloud applications being accessed through web portal, varied medical professionals are able to access the data required using different devices from any location. Exchange of information is better. 4) Scalability:Cloud-based medical billing software can expand along with the growing medical practices in accordance with their budgets and requirements. 5) IT Maintenance: With software being managed on the cloud, practices need no spent time and resources on IT infrastructure – everything is managed online by the vendor. 1) Saving in Time: Regardless of the practice size or type, it is possible to save time in managing the billing process. 2) Cost-effectiveness:Medical billing cost, whether in-house or outsourced, could be reduced when cloud-based billing software is used. 3) Increased Patient Satisfaction:Accuracy and timely billing ensures better patient experience. Moreover, different payment options are provided by the cloud-based medical billing software, making it easy for patients. 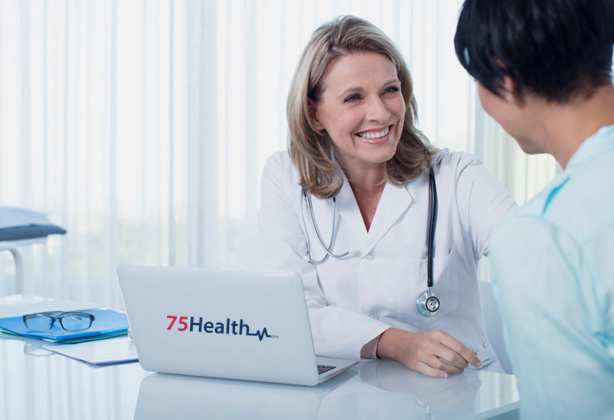 75Health cloud-based medical billing software offers ease of use, increased efficiency, and improved revenue generation to practices. It streamlines the processes involved in all specialties, while enhancing practice efficiency and profits.